This recipe offers a spicy yet cooling alternative to your standard salad dish. 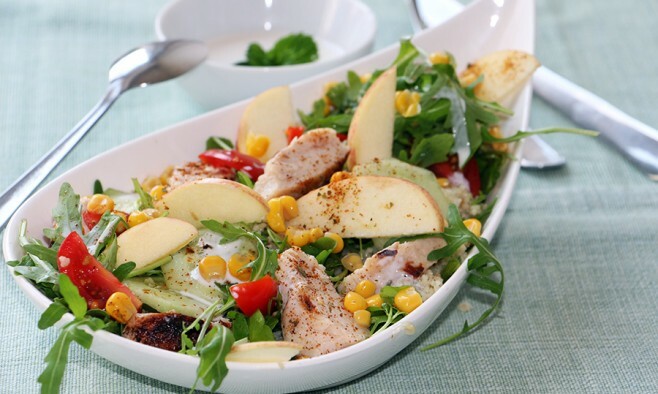 The sweetness of apple and the sourness of the light curry-yogurt dressing complement the chicken. This dish is also rich in vitamins and minerals that will help you to reach the recommended daily intake of nutrients. Wash the lettuce, the apple and the cucumber. Peel the cucumber and cut it with the apple into thin strips. For the curry-yogurt sauce, cut the chives. 1. Cut the chicken into small pieces and season with salt and pepper. 2. Bake the chicken in margarine or olive oil. 3. Add curry powder to the greek yogurt. Press the juice out of a lemon. Stir the juice with the yogurt. Adjust seasoning with salt and pepper. Combine the apple, the cucumber, the cooked corn and the lettuce and give it a slight stir. Season with salt and pepper. Lemon zest can be added to the curry-yogurt sauce for extra flavour. The sweet apple can also be replaced by a sour apple. This dish can be served with slices of whole grain bread or cooked rice. The chicken can be cooked and fluffed. Water can be added to the sauce to become the desirable consistency. The apple can be mixed with the sauce, or an apple compote can be prepared instead of the fresh vegetables. 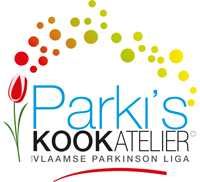 Scientific studies have showed that milk consumption may increase the risk of Parkinson’s disease, particularly in men. On the other hand, fermented products such as cheese or yoghurt do not show this association (Kyrozis et al., 2013). However, more studies are needed to explore the underlying mechanisms of these findings.